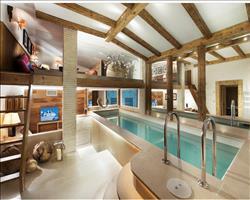 The chalet is situated on the piste and is just a few minutes' drive from the centre of Courchevel 1850. The Chalet is accessible for wheelchair use. Shemshak Lodge is positioned perfectly to enable you to easily ski in and ski out. Giving the advantage of a fantastic central location in one of the most glamorous resorts in the world along with direct access to the extensive ski terrain of the Trois Vallees. The chalet's desirable location means that you are also within walking distance of the famous boutiques of Courchevel 1850 but, as always, you have your own private chauffeur to whisk you back in the comfort of a luxury 4x4. The service is always second to none. Your team will ensure that your stay is uncompromisingly bespoke, providing you with the ultimate winter chalet experience. There is so much more to a holiday than just skiing. We realise that you also want to relax and pamper your body and mind during your stay. You can start the day with a pilates or yoga class to ensure your limbs are warmed up and ready to enjoy a fabulous days skiing. Returning to the chalet after experiencing breathtaking views and exhilarating runs, what is more relaxing than a personalized stretching session to ease those tired limbs? You then can completely wind down by enjoying a massage or treatment of your choice. There is an extensive array to choose from; Swedish to Sports to hot stones, everything is available in a chalet. The spa facilities in our chalets rival private gyms. You can find swimming pools with jet streams and massage jets, Jacuzzis, saunas and hammams along with massage rooms and for more energetic types, a state of the art gym. We work with a team of professional therapists based in resort, who all come highly trained and fully experienced in providing all types of treatments and massage. Bedroom 2: Twin or king size double bed with ensuite bathroom with large walk in shower, dressing room and private balcony. Bedroom 3: Master Bedroom superking size double with ensuite bathroom with bath/shower and twin sinks, private dressing room and private balcony. Bedroom 4: Twin or superking size double with ensuite bathroom with large walk in shower, twin sinks and private balcony. Bedroom 5: King size double with ensuite bathroom with large walk in shower and private balcony. Infant cots: The best bedrooms for putting baby cots are 2, 3 and 4. We update Shemshak Lodge's details often, but facilities do change. e.g. some extras listed by the supplier as "free" or included might only be for the first time you use them, or for one time per party, then charged for further use. If any specific feature is essential to your holiday, make sure you ask us to confirm the details of it before you book your holiday. This accommodation only holiday to Shemshak Lodge in Courchevel, France departs Sunday 19th April 2020, for a 7 night stay on a "catered chalet" board basis. A local tourist tax (Taxe de Sejour or Kurtaxe) is levied by many councils in European ski resorts. It varies by standard and type of accommodation and is age dependent, so not everyone is charged. It's not included in the basic price of your holiday and is usually paid locally. For reference, the average charged in winter 15/16 was between 50p and £2 per person, per night. Courchevel lift pass price last reported as €218 (adult 6 day). Ask for a quote when booking Shemshak Lodge. Le Namaste Courchevel France, Without Flights to Without Flights 19th April.